You may regret asking me here, because I’ve come to creep you out. That’s right, I’ve come to give you nightmares with two short words: They’re real. The Fade, the monsters from my novel Arclight, actually exist on planet earth at this moment. Deep within the South American rainforest, lives a horde of creatures that’s millions strong. They’re nocturnal, and carnivorous. They spread out and devour everything in their path – alive. Their prey tries to run, but they keep swarming, keep eating, until it falls dead and they strip the flesh from its bones so they can move on. They’re silent, except for the whispering click of their feet on the march. They can walk up walls and over ceilings. They will eat people. These creatures cannot be wiped out – there are too many, and their places of origin are too remote. They can’t be blocked, because that giant horde can break apart into smaller units that will wriggle into anything through a single crack. They’re a hive mind, without free will. There’s nothing supernatural about them; they weren’t cooked up in some laboratory or mutated by a random lightning strike. No, these things are born killers, and have been since the beginning. They eat. They advance. That’s it. And once they’ve passed on, nothing remains of the world behind them, except silence and death. Meet the real-life Fade, also known as army ants. Army ants are smart. They’ve adapted for survival. The monsters in Arclight operate like that. They’re a hive mind, and they work together in near infinite numbers that continue to grow, day-by-day. By the time you could disable one Fade, thousands, even millions more are already standing in its place. Each one makes more of itself, and never stops doing it. You can’t destroy enough to get ahead of the cycle. Imagine looking out your window and knowing the world only extends for as far as you can see. Everything beyond that point is sealed into a jet black wall. But then the next day, you look out the window again, and the wall has moved five feet closer. The next day it’s closer. The next it’s closer. Every day. And you can no more convince them to stop than you could convince a wave not to drown you. It doesn’t mean to; there’s no intent involved at all. It’s simply doing what it does. People run from ant swarms, but the swarms are faster, and they can branch around to surround what they’re hunting. People run from the Fade, but lose for the same reason. Their senses are better than ours. They’re a part of their environment, and we’re not. Suddenly, the whole thing turns on its head and the humans end up at the bottom of a pile that’s heavy enough to crush us. Thanks for that Josin… I’m going to tape down every crack under my outside doors and have a shower now to get rid of this itchy feeling! 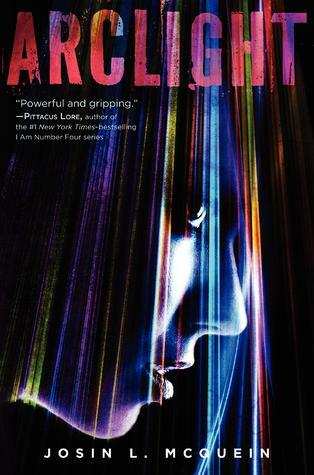 Arclight was published on August 5th by Electric Monkey and you can find out more about it here. ha ha, i meant now. i’m totally creeped out NOW. Stupid fingers typing on my stupid phone. sorry.